1Andrew L. Puryear (e-mail: puryear@mit.edu) and Ronald R. Parenti are with MIT Lincoln Laboratory, Lexington, Massachusetts 02420, USA. 2Jeffrey H. Shapiro is with the Research Laboratory of Electronics at the Massachusetts Institute of Technology, Cambridge, Massachusetts 02139, USA. 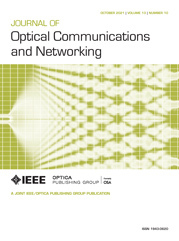 Free-space optical (FSO) communication provides rapidly deployable, dynamic communication links that are capable of very high data rates compared with those of radio-frequency systems. As such, FSO communication is ideal for mobile platforms, for platforms that require the additional security afforded by the narrow divergence of a laser beam, and for systems that must be deployed in a relatively short time frame. In clear-weather conditions the data rate and utility of FSO communication links are primarily limited by fading caused by microscale atmospheric temperature variations that create parts-per-million refractive-index fluctuations known as atmospheric turbulence. Typical communication techniques to overcome turbulence-induced fading, such as interleavers with sophisticated codes, lose viability as the data rate is driven higher or the delay tolerance is driven lower. This paper, along with its companion [J. Opt. Commun. Netw. 4, 947 (2012)], present communication systems and techniques that exploit atmospheric reciprocity to overcome turbulence that are viable for high data rate and low delay tolerance systems. Part I proves that reciprocity is exhibited under rather general conditions and derives the optimal power-transfer phase compensation for far-field operation. Part II presents capacity-achieving architectures that exploit reciprocity to overcome the complexity and delay issues that limit state-of-the-art FSO communications.